Hooray for Thumb Shifters! – Splat Kerplunk! 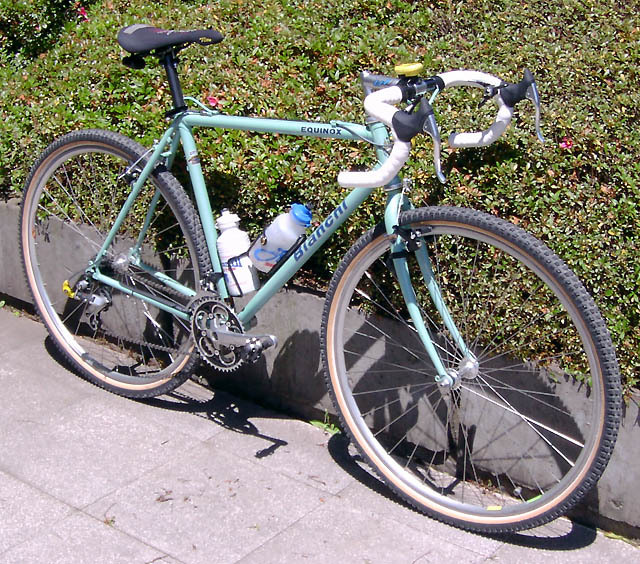 I bought a nice Bianchi Equinox Cyclo-Cross/Touring bike from the tip last week. It has Suntour XC Pro and XC Comp components – all very high end stuff back in 1989. It’s in extremely good nick – all I needed to buy were new tyres and rim tape, squeeze some lubricant onto the chain and true the rear wheeel slightly. It rides like a dream, BUT it is seems to automatically make me want to ride at cruising pace. So I’ve decided to keep one of my old racier bikes for whern I need a blast of speed on the way to work. It’s a Kuwahara frame from 1979 originally a Bennett Sebring II. I added light 27″ wheels, Suntour 5 speed cassette, Suntour AR rear derailleur, Shimano Altus front derailleur, and I moved the downtube shifters up to the flat handlebars. I just used old Shimano SL-MY-20 6 speed SIS indexed shifters which have a switch to make them friction shift instead of index shift. They work great, in fact they work better than I thought they ever could. Why did we invent indexed shifting again? I actually prefer friction shifting with these thumb shifters! The only problem is that they stick up above the handlebars and are more awkward than new shifters which sit under the handlebars. So I am going to move them so that they sit upside down under the bars and are easier to reach with a natural thumb position.